Remember Ping, Apple's music-focused social network? Well, you can forget it again - when iTunes 11 ships, Ping's getting the bullet. That's not all iTunes 11 is up to, though: while the rumoured Spotify-style streaming service and new audio format are yet to appear, if indeed they exist, iTunes 11 is still a big upgrade. But when will it ship? We'd expected it by now, but it has been the subject of a delay. 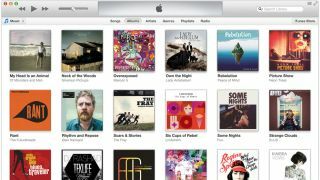 So expect the new iTunes 11 release date to be late November. In other words, during the coming days. Apple spokesman Tom Neumayr told CNET: "We look forward to releasing this new version of iTunes with its dramatically simpler and cleaner interface, and seamless integration with iCloud before the end of November." Hopefully Apple's ugly duckling is turning into a beautiful swan - or a less ugly duckling, at least. So what's new, and why should you sort out your album art? Let's find out. The iTunes UI has been given a makeover, and it looks more like the iTunes Store than the app of old: the Store has been given a makeover too, and the line between App and Store is getting rather blurry. That's not necessarily a bad thing, though: if Apple had made iTunes 11 look like PoundLand it'd still be prettier than the current version. The whole UI has been simplified, and one of the most noticeable differences is the lack of sidebars. They're not gone completely, however: they're just missing from the Grid View, which is the view Apple clearly expects you to spend most of your time in. It looks very much like the current Grid View, but when you click on an album cover the new Expanded View appears in much the same way folders show their contents when you touch them in iOS. As you'd expect, Expanded View shows you the track listing, but it also shows your star ratings, the running time, and an iCloud download button if you own tracks but don't have them on your Mac. If the album is incomplete you'll also see a "complete my album" link as well as individual buy buttons for the tracks you don't own. If that gets annoying, which we're sure it will, there's a "Hide iTunes Store songs" option. In a nice touch, iTunes' Expanded View tries to make its background match the selected album art - so if it's a dark cover you get a dark background, and if it's like a luminous banana you get a yellow one. Album art also appears in the MiniPlayer and even in search results, so this would probably be a good time to sort out your iTunes album art: version 11 is going to look pretty rubbish without them. The MiniPlayer has been freshened up too, and it gains access to iTunes' new Up Next feature. This is a little list icon that also appears in the main view's status window: click it and you'll see the next three tracks iTunes intends to play. If you don't fancy what's coming up, the MiniPlayer now has a search button you can use to find and queue a specific track without opening up your library. Have you ever previewed an iTunes song when you're out and about and thought "man, buying from iTunes is far too difficult! I'll make a mental note to buy this when I get home!" No, us neither, but that's exactly what Preview History enables you to do: if you've clicked a music, film or TV programme preview on an iCloud-enabled device and haven't sealed the deal, iTunes 11 will chase you around the house until you click the buy button. Not really. It'll just show you a list of the things you've previewed. You knew this one was coming: Ping goes and Facebook takes its place. iTunes 11 will let you see if any of your friends have hit Like on any iTunes content you're considering buying, and when you buy something you can then share the earth-shattering news with everybody you know on Facebook. We know. We're excited too. Facebook isn't the only social media feature appearing in iTunes 11: you can post to Twitter too, and artist pages now have Galleries that will be able to provide photos and tour details as well as music. Could concert tickets be in iTunes' (and PassBook's) future? Imagine: we could end up loving Apple as much as we love Ticketmaster! We've already mentioned the iCloud download links for media you own but don't currently have on your Mac, but iTunes 11's iCloud integration goes deeper than that: in many ways iTunes 11 is just a window into iCloud, with tracks automatically appearing in your library when you buy them on any iCloud-enabled device and giving you the ability to move seamlessly from one device to another, for example by watching the beginning of a film on your iPod touch, pausing it, and resuming playback on your Mac. This feature works for movies, TV shows, audiobooks, podcasts and iTunes U lessons. Apple says November, and as ever iTunes 11 will be free for both Windows and Mac users.